It's hard to know where to begin, so I feel I should just jump right in. As I've mentioned in previous posts, and I'm sure as many of you are already aware, the Spring 2013 International Quilt Market was held in Portland, OR this year. Marie generously registered me as an ambassador for Cool Cottons, for which I am truly grateful! Since she had actual appointments with fabric companies on both Friday and Saturday I was manning the store those days, but had set aside Sunday for wandering through the Oregon Convention Center. Another bonus of the event was all of the peripheral events attached. In addition to the class with Jacquie Gering (blogged here) at Modern Domestic, there was a Happy Hour event, dinner with a wonderful group of folks, some new acquaintances but all familiar from their blogs and/or design companies, and a special PMQG program for its monthly meeting. And a late-discovered plus is that I was joined by my friend Cherie, of Pieced by Cherie for the show itself! So, on to the photos (not as many as I would like, but really one just gets caught up in the energy and spectacle of it all and forgets the camera hanging from her wrist). A new design from an old favorite of mine. A little corner of Anna Maria Horner's section of the Westminster Fabrics booth. Everyone seems to have been agog at Heather Bailey's booth - the scale embroidery on the wall really was something else! Cherie and I were drawn in by their booth and designs. Jeni Baker's (In Color Order) booth, debuting her second fabric collection with Art Gallery Fabrics, I believe. Beautiful work! A Quilter's Dream - a plethora of great patterns to choose from! 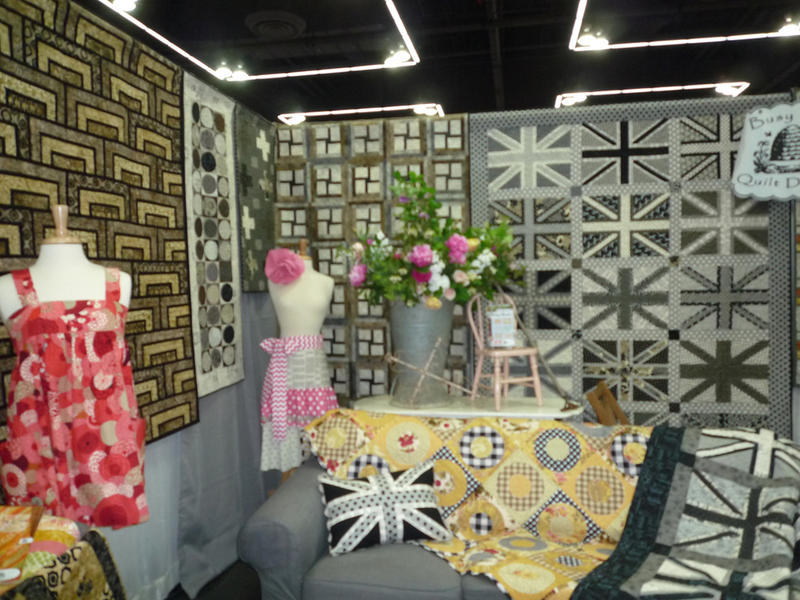 A great booth put together by Busy Bee Quilt Designs, right here in the greater Portland area! And not to be left out, I had to get at least ONE photo of myself with someone exhibiting... and who better than someone I know and like as much as Michelle!? It was a blast to wander around, bump into people I have gotten to know over the years in this industry, and just take in all of the eye candy and positive energy! I walked away with a bit of swag - a few new buttons, brochures and tear sheets for some great pattern designers and publishers, the germ of an idea for a new venture planted by someone else, a set of the first 5 issues of Modern Quilts Illustrated by Weeks Ringle and Bill Kerr (and we had an awesomely engaging chat with Mr. Kerr, what an interetsing guy!) and a GORGEOUS collection of the BEST thread on the planet - at bargain wholesale price! However, I can't believe that Cherie and I forgot to get our picture together at Market!! Maybe next time, right? I also have to give a shout out to the lovely group of ladies who let me join them for dinner at Tin Shed Friday night - it was a pleasure spending time with you all, and getting to know new faces! Jenn, Jessica, Caroline, Latifah and Connie. I'm not yet active on Instagram, but maybe one day will join the 21st century and switch out my cell phone for one of those "smart" things! A Day with Jacquie Gering!